The major release this year, WordPress 5.1 has been scheduled to be released on 21st February 2019. With this release, users will be able to experience 165 enhancements including many new interesting features. 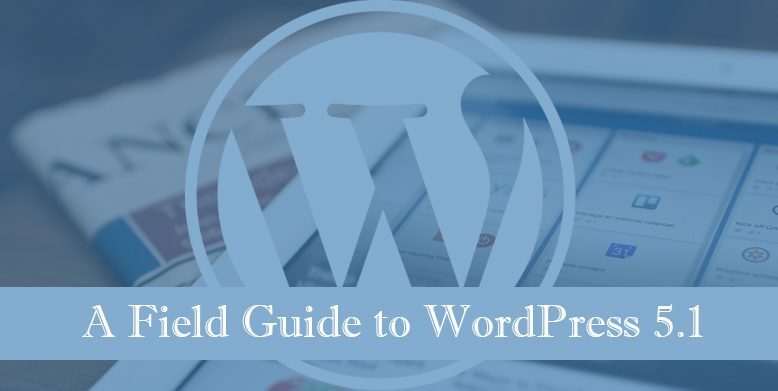 The core development team released a field guide to WordPress 5.1 in the official core channel of the team, make.wordpress.org on February 8, 2019. The guide, posted by Jeffrey Paul, lays down the major changes that will be seen in the upcoming major release. Jeffrey strongly suggests users test their plugins, themes, and sites with WordPress 5.1 before the release so that they don’t have to face unanticipated issues later. WordPress 5.1 will includes enhancements including the projects, Servehappy and Site Health. It is also going to include many enhancements and bug fixes regarding the Gutenberg editor, a new database table for multisite metadata, cron improvements, new JS build process, and more. Let’s have a detailed look at the enhancements we’re going to see in WordPress 5.1. In WordPress 5.1, you’re likely to receive notices if you’re sites are running on long, outdated versions of PHP, the programming language that powers WordPress. WordPress will start honoring plugin PHP version requirements as well. The Site Health feature will check whether a plugin requires a version of PHP incompatible with your site when you install a new plugin. If it finds any, WordPress will prevent you from installing that plugin. The enhancements included in the latest version of Gutenberg editor plugin, v.5.0 will be shipped into WordPress 5.2. A new database table to store metadata associated with sites has been introduced. It supports the storage of arbitrary site data relevant in a multisite/ network context. WordPress 5.1 will include a change in behavior for cron spawning on servers running FastCGI and PHP versions 7.0.16 and above. It includes an enhancement that updates the return values for functions used to modify scheduled tasks. Also, it includes two new functions to assist with returning data and new filters for modifying cron storage. The JS code reorganization which has not been updated since April 2018 will now have a fresh build process. It will ship out with WordPress 5.1. A new CSS styling for Admin Table Pagination Links has been introduced in WordPress 5.1. The CSS change improved the color contrast ratios for better accessibility and improves consistency across the admin screens. The pagination links are now styled like the standard WordPress buttons. The background color will no longer change to blue on hover and focus. WordPress 5.1 also includes miscellaneous changes for developers including a new function called human_readable_duration, user-related short circuit filters, improved taxonomy metabox sanitization, LIKE support for meta keys, new REST API Notice, and more. Know more about the changes here. You can read the full field guide to WordPress 5.1 here. Please, test your code. So that any prevailing issues can be fixed beforehand and help you and other millions of WordPress users and sites. Next → Next post: WordPress 5.1 Release Candidate Now Available!